I suspect that one of the circles of hell tortures its victims by having them sit behind a wheel of a car at the very pinnacle of the Bluewater Bridge, looking down at the long and slow-moving line-up of cars waiting to enter Canada, while at the same time desperately needing to pee. But we held it in. Both of us. And I have never been so grateful to spot a Tim Horton’s near an off-ramp as I was yesterday around noon. We spent about an hour standing under the Bluewater Bridge, in a waterfront park the city of Sarnia has reclaimed from the railroad. There was a playground, and people even dipped their toes in the St. Clair River and watched the lakers chuff past. Some even swam, though the St. Clair has such a current, we could really see it pulling those swimmers downstream. The Bluewater Bridge is a marvel of engineering, and one of the best views is standing under it. We also were impressed by the community of Point Edward, which has a small downtown near the base of the bridge, not too far from the park. It’s proximity to the water gives it the feel of a summer playground, not unlike Wasaga Beach, though I suspect they get fewer tourists. I always find border cities to be fascinating. How is it to live so close to your neighbours, and yet be so far away? I suspect it’s possible to swim across the St. Clair river and climb out on Port Huron. It would be patently stupid to do so, especially dodging incoming lakers, and you’d probably be quickly arrested once you got to the other side, but it’s possible. And throughout Point Edward, there is this odd sense of living up against a fence. The Bluewater Bridge boasts a number of facilities which probably employs dozens in the local community. This includes the customs gates themselves, a currency exchange and, of course, the duty free shop and its associated coffee shop and janitorial staff. The duty free shop sits on St. Clair Street, but does not front onto it. To use it, you have to take a roundabout route to get past the bridge’s tollbooths. Access to its parking lot is blocked by a large wrought-iron fence and a big gate that is rather imposingly locked. Indeed, the entire customs and duty free area on the Canadian side of the Bluewater Bridge is fenced off — as it should be for security purposes, but sits right next to a residential area. There is a house on St. Clair Street. Its yard abuts the customs area and the duty free shop on two sides. What do you do if your ball goes over the fence and into the secure area? Probably get a new ball from Canadian Tire. Even the bridge’s pylons are surrounded by chain-link fences — possibly to discourage people from climbing up the underside of the bridge. It must be odd living in such an environment, but people do. 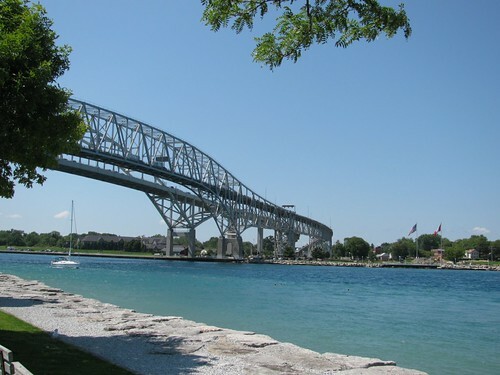 There is economic life to be had in Sarnia and Point Edward, even if thousands of people live within one kilometre, but more than an hour’s drive away. As you may have guessed, we’re back in Kitchener, and seem to have brought the heat back with us. Other than there being too much (ahem) water at the Bluewater Bridge, the trip was uneventful and we got in before suppertime. The kids are adjusting to the new time zone and to missing their American grandparents. A bridge on a playground set, with the big bridge in the background. A great laker on the water. Zooming out from the shot above.